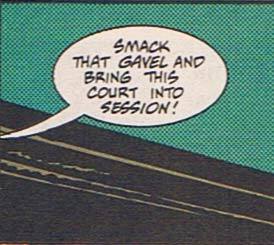 Random Panel: My new favorite euphemism for … well. Ahem. 7 Responses to Random Panel: My new favorite euphemism for … well. Ahem. First Judge: (very camp) Oh, I’ve had such a morning in the High Court. I could stamp my little feet the way those QC’s carry on. Second Judge: (just as camp) Don’t I know it, love. First Judge: Objection here, objection there! And that nice policeman giving his evidence so well – beautiful speaking voice … well after a bit all I could do was bang my little gavel. Second Judge: You what, love? First Judge: I banged me gavel. I did me ‘silence in court’ bit. Ooh! If looks could kill that prosecuting counsel would be in for thirty years. How did your summing up go? Second Judge: Well, I was quite pleased actually. I was trying to do my butch voice, you know, ‘what the jury must understand’, and they loved it, you know. I could see that foreman eyeing me. Second Judge: Yes, cheeky devil. First Judge: Was he that tall man with that very big… ? Second Judge: No, just a minute – I must finish you know. Anyway, I finished up with ‘the actions of these vicious men is a violent stain on the community and the full penalty of the law is scarcely sufficient to deal with their ghastly crimes’, and I waggled my wig! Just ever so slightly, but it was a stunning effect. First Judge: Oh, I bet it was… like that super time I wore that striped robe in the Magistrates Court. Speaking of . . . ahem. Jeff, I have a confession to make. I’ve been cheatin’ on you, man. I’ve been sneakin’ out to go make characters on Hero-O-Matic. I just couldn’t help myself. I’ve really gotten to like the look of those Bruce Timm-inspired characters. If it makes you feel any better, I’m working on a story where the original HeroMachine characters are heroes from the World War II era, and the Hero-O-Matic versions of the same characters are the new, present day generation. This might make you feel even better. I created my first set of supers on HeroMachine and their Hero-O-Matic versions JUST DON’T LOOK AS GOOD! The OFFICIAL versions of that first set of characters will ALWAYS be the HeroMachine versions. But you know what HeroMachine really has going for it? The ability to save characters and edit them later. When you want to edit a character in Hero-O-Matic, you have to rebuild the character from scratch every time. That’s a pain! So you see, it’s not you, it’s me. I just wanted there to be some honesty in our relationship. I hope we can still be friends :). (Seriously, Jeff, I was just kidding about all the girly relationship stuff. It was just that I felt a little guilty about praising HeroMachine so much and then using Hero-O-Matic. Then I thought it would be funny to write this comment as if it were a Dear John letter. Don’t worry. I’ll still be using HeroMachine :). No worries, Niall, I like Hero-O-Matic too, I’ve always been a big fan of the Timm-style character designs. I like the shading they put on their objects too, it makes the whole thing look really tight and well put-together. I’m thinking long and hard about the style of art to use in HeroMachine 3. I’m pretty confident it won’t be a direct Timm-style look, as I think that’s already been done and done well, but it definitely needs to be something stylish, fresh, and consistent. I love the way the Kirkman/Walker/Ottley characters in “Invincible” look, it’s possible I may go in that direction when the time comes. I’m not familiar with that style. Where can I find examples online? Found it. I also found out you can read the first issue of “Invincible” and a whole bunch of other Image Comics on the company website. Image has some of the best quality art and storytelling I’ve seen in comics, although I’m still a newbie when it comes to finding out what’s out there. I’ve read a couple of the “Leave It to Chance” books, and I’ll swear I’ve seen another one that was really cool, although the name escapes me. The basic premise goes like this: an alien wearing a highly advanced power armor suit crashes on earth. A young boy (our hero) finds the alien and cares for him until he dies of his injuries. In gratitude for his kindness, the alien gives the kid the suit, which gives the kids all kind of superpowers. You know the book I’m thinking of? No, don’t know that one, but it sounds neat.